I am a broccoli fan and over the years have tried to promote it. Lately, I have been pushing my roast broccoli and broccoli apple salad recipe. You can’t really lose with broccoli. It is packed with nutrients and low in calories. Eat it all day long and you will live to 100! Or at least you will have a better chance than the non-broccoli eaters in the world (you know who you are). 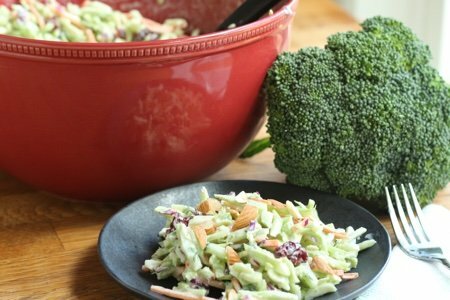 This salad can be made with heads of broccoli or 2 bags of broccoli slaw (which you find in the produce section next to the salad in bags). This is a fall salad because it has dried cranberries in it. Obviously, you can’t eat dried cranberries until fall, right? I love the crunch of the broccoli paired with the sweetness and softness of the cranberries. This salad is as much about texture as it is flavor. Broccoli slaw is much like cabbage slaw. 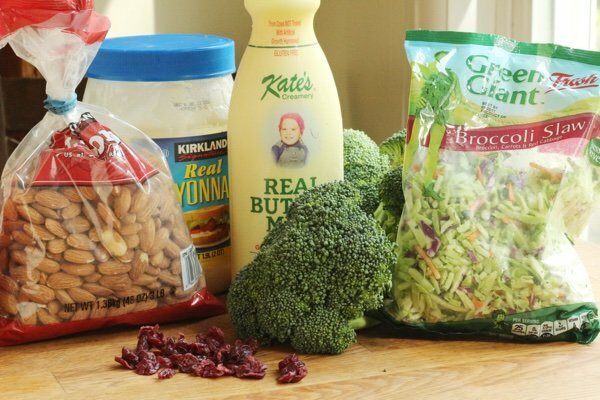 You shred the broccoli, add your favorite garnishes, and then mix in a mayonnaise/vinegar dressing. If you are trying to lose weight, mayonnaise is one of those high calorie foods (94 calories per tablespoon) that you need to use sparingly. How are you gonna get creamy slaw without a cup o’ mayo? The answer is buttermilk. For 99 calories per CUP, you can pour it on and the tangy creaminess with save the day. I used my food processor to make this slaw in a flash. 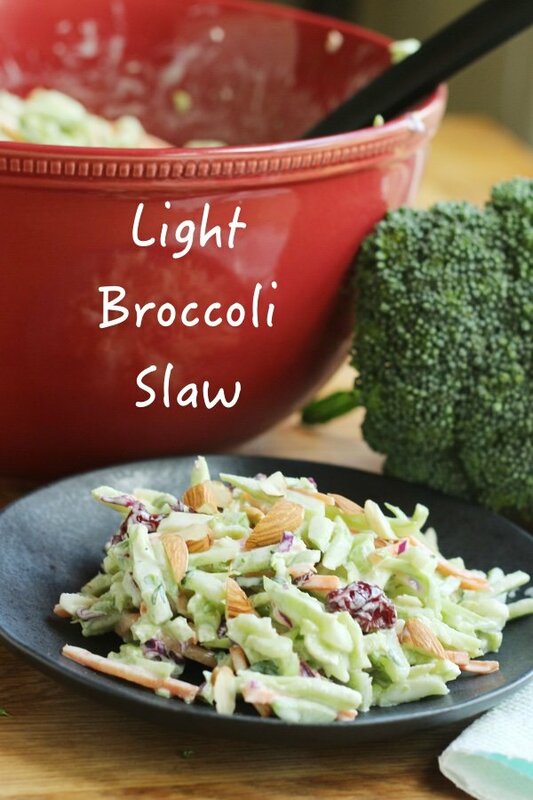 Even faster, I purchased broccoli slaw in a bag and just mixed in the other ingredients. 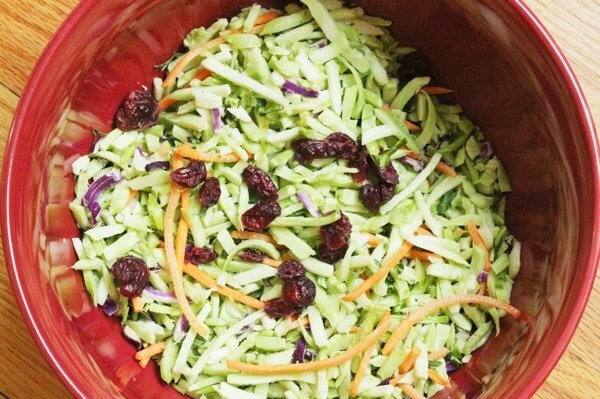 Put this slaw in your lunch box or next to your favorite grilled chicken dish. I like to eat it as a snack because the crunch will keep me away from potato chips. In another bowl, mix together the buttermilk, mayonnaise, and cider vinegar. Pour dressing over broccoli, almonds, and cranberries and toss. Taste and add salt and pepper. Serve immediately or store in your refrigerator for up to three days. This slaw does improve with age (but there is a limit). I keep trying to find a slaw recipe (any kind, not just broccoli) that I like and that are healthy but to no avail. I do love to add plain broccoli slaw atop my salads. This recipe gives me hope! Ingredients are going on my shopping list today. Thank you! Sounds yummy! Broccoli is one of my staples. With recipes that call for mayo, I always substitute half with plain yogurt. I wonder how the yogurt compares to the buttermilk. This is delicious! Definitely a keeper. I used this dressing on the broccoli apple salad. Except I forgot the carrot and added almonds. Everyone liked it. I wondered if the point count would come down if you used fat free mayo (like Kraft or Miracle Whip) instead of whole fat mayo. So I put it in my WW recipe builder with the fat free, and it comes out to 4 SmartPoints per cup. The biggest point count comes from the dried cranberries. But they add much-needed sweetness. But I wonder if you could substitute pineapple chunks. I make a coleslaw with buttermilk in the dressing and also pineapple chunks. For a change, raisins could substitute for cranberries, and sunflower seeds for almonds. The only thing I wonder is about the pre-purchased broccoli slaw. I feel like it's just broccoli stalks & does not include any of the florets. I think that most of the health benefits of broccoli are in the florets & not the stalks. What do you think? I've been thinking this for awhile now but no idea if I'm right or not. I like the slaw better than florets raw...but feel like I'm not getting the health benefits. Does anyone know? Erika -- You raise an interesting question about the lack of florets in pre-shredded packages. I've often wondered if pre-shredded vegetables were created to use the 'still good' portions of vegetables that are overripe. So, the florets are stalks because that is the part to show wilt last; same with shredded cabbage. Were wilting outer leaves removed and still good shredded inner core sold to us? I've never trusted preshredded items because of this; always cut or grated my own. Q: I prefer broccoli stalks to the florets. Which is more healthful? A: All parts are good for you. Broccoli is one of the most nutritious vegetables, providing vitamin C (a day’s worth in a cup, chopped), potassium, B vitamins (including folate)—even some calcium and iron. Ounce for ounce, the florets and stalks deliver equal amounts of these nutrients, according to the United States Department of Agriculture (USDA). Broccoli (like other cruciferous vegetables) also contains sulforaphane and other compounds that may protect against certain cancers. However, the florets, which are where the seeds and flowers develop, have a higher concentration of protective phytochemicals, notably beta carotene and other carotenoids as well as sulforaphane. The stalks, on the other hand, have more fiber. Eating all parts of broccoli— even the leaves—is a good idea. Look for broccoli with dark green or purplish (not yellowing) florets. To preserve nutrients, don’t overcook. I would mix some fat free plain yogurt and a little buttermilk and a smidgen of low fat mayo to keep points down. Since I prefer a sweeter cole slaw, I would use a little bit of Truvia and less of the cranberries. Add apple and you still have a crunchy, sweet salad. Walla!